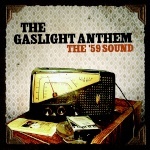 The Gaslight Anthem Fan Forum • View topic - Got a Gaslight Guitar! I just got a new guitar with my mom to celebrate me getting into college with a merit scholarship. And the guitar I bought is the same one Brian used in Lollapalooza and the one he has in the interview with Fender. The all mighty Fender Telecaster! Its a great axe! Don't mind the awkward photo, just want to show you guys its the same thing haha. Re: Got a Gaslight Guitar! What college are you going to? Nice, looks like a good guitar. You should post some videos or audio of your TGA covers.